It must be tough living in the shadow of one of the world's most beautiful and successful actresses. And for Nancy Motes, her life as Julia Roberts' younger half-sister has proved anything but easy. In her first ever interview with The Sun, Nancy spoke about her battle with obesity and depression, and how Julia would often make derogatory comments about her weight. 'When you're in a family of very, very exceptionally beautiful people it's intimidating,' said Nancy in an exclusive interview with The Sun. 'I think that growing up as Pretty Woman's little sister has definitely made me try to see the person inside and not the person outside. The 37-year-old reached 20 stone at her heaviest and Nancy said she always felt like an embarrassment to Julia, 45, because of her weight. After spending £20,000 on a gastric bypass surgery in June 2012, which was financed by a loan that Nancy had to take out and a little help from her mother, she is now down to 11 stone. Nancy who grew up with the family in Smyrna, near Atlanta, Georgia wanted to be a movie star like Julia and her other siblings, Eric Roberts and Lisa Roberts Gillan, but claimed to have got no help from her famous sister. Julia was remembered as being pretty and popular at school before moving to New York at 18-years-old for acting classes, and in 1989 was nominated for a Best Supporting Actress Oscar for her role in Steel Magnolias. She then picked up the iconic role as prostitute Vivian in Pretty Woman, which 13-year-old Nancy was bullied for at school. According to Nancy, Julia would constantly tell her how overweight she was, and did not want her to follow down the path to Hollywood because of her size. Nevertheless she still went to auditions, and did a few waitressing jobs before the cost of living got too high and she returned to Georgia to focus on theatre. But in 2009 their mum Betty had a heart attack, they pair have different fathers, and Julia moved Betty to LA to be closer to her and her grandchildren. Nancy then moved West too after sparking up a relationship with John Dilbeck who was from LA. 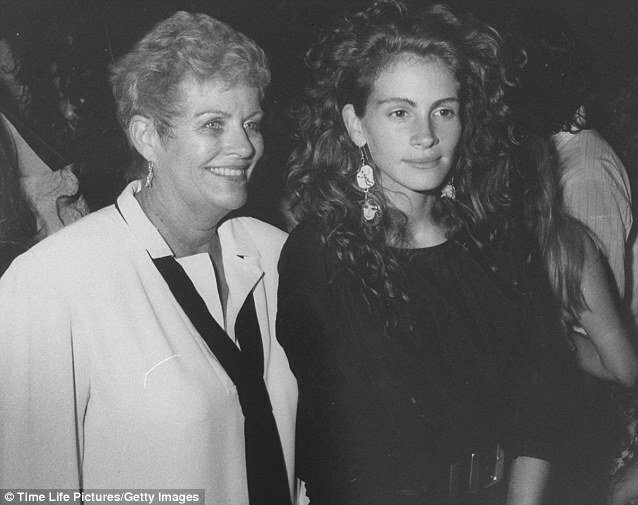 Looking after mum: Julia Roberts and her mother Betty Motes - Betty suffered a heart attack in 2009, so Julia moved her from Georgia to LA to be closer to her. She even suspected she saw Julia making comments about her size at her birthday party. But Nancy suffered from depression and would often comfort eat, namely fast food such as burgers and chocolate milkshakes. Despite everything she hoped to rekindle her relationship with the Pretty Woman star, as she feels better about herself having lost seven stone and John recently proposing to her on the set of Glee, where she secured a job as a production assistant thanks to her sister's contacts. But she is still not sure if Julia will attend her wedding next May, and referred to it as a 'work in progress,' but remains certain in her heart that they family all love each other.